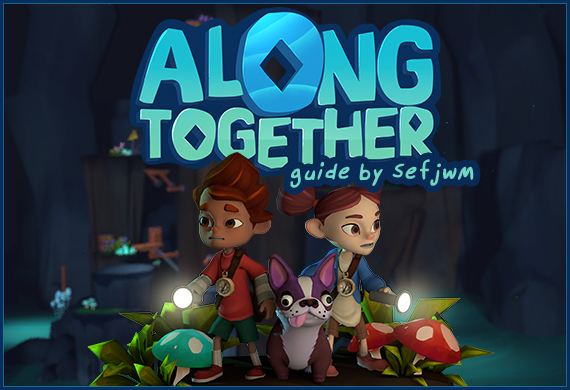 Along together is a diorama style puzzle game. You help a young girl or boy trying to get back to their dog Rishu. You can guide the child through each area and assist them by manipulating different things inthe environment. I was originally going to write a walkthrough for this but my 5 year old beat it so it's not necessary. The puzzles aren't bad and nothing is missable. Just play through the game and enjoy it. Any missed collectibles or tasks can be completed at any time through chapter select. Earn all other trophies in Along Together. Story related. You get this for completing the game. Find every treasure in the game. Each treasure is a childhood toy. These all have a small glowing particle effect around them and they aren't too hard to find or get to. Every level has 1 toy and your progress is shown on the level select map. 1-1 The Beginning - Game Boy - This is up the platforms and to the left. You walk right past it. 1-3 The Fort - Cassette Tape - In the second area you will see some wooden boards high up in front of the bridge (there are white birds on it). When you get to that section spin the log to raise the platform all the way up to it. 1-4 Mechanical Tree - Soccer Ball - You can see this off to the left on some islands. There are two hidden buttons. One is in front of you behind the bush to the left. The other it around the right side of the tree on the right. Step on both of these to create logs that let you get to it. 1-5 The Mountain - Dump Truck - You will come to a spinning log with a big gear on the end that you use to spin it. The truck is on the right platform. Spin the log to make a bridge to it. 2-1 The Mines - Racket - Before using the slingshot walk past it and drop down to a ledge with the racket on it. 2-2 Broken Tunnels - Sock Puppet - In the second area there is an optional stalactite in the distance. Use the slingshot to bring it down. The sock puppet is on the platform with the yellow warning sign. Use the left elevator box to get down to it. 2-3 Elevator Ride - Magnifying Glass - As you progress the level you will come to a section where you can't ride a mine cart because the ceiling is too low. The magnifying glass in on the barrel just before the low ceiling. 2-4 Falling Rocks - Cell Phone - Right off the start, after you drop the wall, there is a track junction. Pull the lever to switch the track to go right and drag the mine cart onto the button on the right. This will raise a platform with the phone on it. 3-1 Car Crusher - Laser Gun - Climb up the car to the left and go all the way until the two buttons across from Rishu. The gun is on a ledge down and to the right. Push the yellow (left) button to drop the car in the distance and extend a bridge to the gun. 3-2 Heavy Machines - Action Figure - Once you get the first car into position, climb it and head over to the one on the track. Step on the button to unlock it and drag it onto the same button. Spin the platform on the right to raise it. Now use the yellow button to drop the magnet down and lift the piston so that the bridges extend. Get on the platform and spin it back down again. The action figure is to the right. 3-3 Lifted - Joystick - This is on the platform hanging off the bottom of the crane. Move the car to the right side of the teeter totter thing to drop it down into the button. Pull down the wooden box to lock it in place and the metal box to let you climb up. Now grab the car and put it all the way to the right. Then swing the empty crane all the way back to the left. Drag the track with the car on it close to the platform and use it to climb up to the joystick. 3-4 Over the Edge - Teddy Bear - Immediately turn around. It's in the garbage can that fell over. Find all treasures in the Forest. Find all treasures in the Caves. Find all treasures in the Junkyard. Complete Reach the end of the Caves. Story related. You get this for completing the Caves. Reach the end of the Forest. Story related. You get this for completing the Forest. You get this for collecting 7 treasures. See Treasure Hunter. The very first treasure is the Game Boy. It's in level 1-1 (The Beginning) up the platform and to the left. You have to walk right past it. Work with Rishu to cross the bridge in 2-1. Story related. In level 2-1 (The Mines) you help Rishu and he helps you through the level. This will unlock towards the end of the level. In the second area of level 1-3 (The Fort) you will pull a level that lowers a large bridge. Right after the bridge lowers the child will celebrate and look to you for a high five. Give them a high five to get this. Hit 20 targets with the slingshot. There are multiple things I believe count as targets; red lights, apples, and stalactites. Either way I got this before finishing the game or replaying any levels so it's pretty much story related. It's very likely you will get this without realizing it. In level 3-4 (Over the Edge) there are multiple shooting stars in the skies above the cranes. Just watch the skies and this trophy will unlock after you see one. Score 5 points on the handheld game. Score 20 points on the handheld game. Score 40 points on the handheld game. One of the treasures is a Game Boy that plays a single game. Every time you press the box creature jumps to opposite side of the screen (top/bottom). You have to dodge spikes on the top and bottom and a spiked ball that appears in the middle section of the screen. The obstacles are randomly placed each time and the worst one is when a spiked ball is close to the spike. Each time you pass an obstacle you get 1 point. Get 40 to unlock this and all previous box jumper trophies. The trick is to not go back and forth between the top and bottom. Instead, stay at the bottom, jump the spikes and then "jump" again to return back to the bottom. It takes a little practice to get the timing right but you can dodge all the spiked balls (even the close one) this way. This is the reason I rated this platinum a 2 difficulty. It seems harder than it is though, and I got after only maybe 10 minutes of trying. Sometimes you get really bad layouts but even then you should be able to dodge everything without much trouble. Play with every treasure at least once. Once you find a treasure it appears on the shelves to the right of the chapter select. I'm pretty sure you have to press for each to "play" with it. This one was kind of glitchy for me as I played with every toy but then had to go back later and play with them all again. About half way through the trophy popped. Crush 5 cars in the junkyard. In level 3-1 (Car Crusher) you have to crush a car to continue. Crush 5 cars to unlock this. I tried to do this in a couple levels but Rishu is usually distracted or too far away and I couldn't get it to work. In level 2-4 (Falling Rocks) towards the end of the second area you can get close to Rishu. Use your hand to pet him. He will roll over and have you rub his belly. The trophy will unlock when this happens. You can probably also do it in 3-1 (Car Crusher). Complete level 1-2 without shooting any birds. In level 1-2 (Crow's Nest) do not shoot any birds. This will unlock as you complete the level. Make a stalactite splash down in the water. Story related. In level 2-2 (Broken Tunnels) you come to a point where you have to shoot the stalactites to make them drop down and create platforms. Shoot them down to unlock this. Knock down all the apples in 1-3. In level 1-3 (The Fort) the trees have apples on them. Shoot all of them off the trees to unlock this. Thanks for the guide sef!